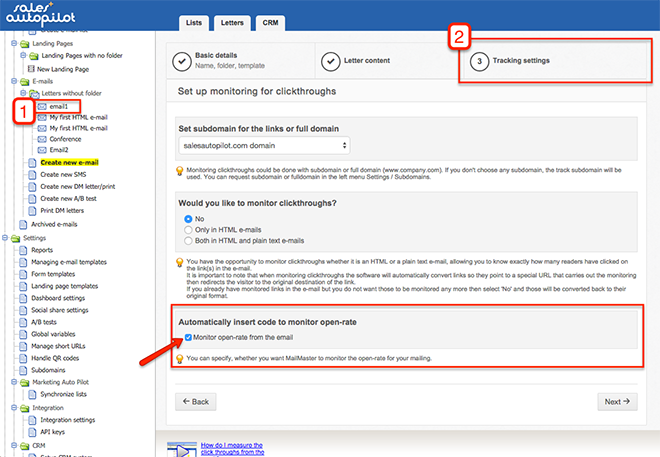 When you create a Multipart email, in the third step of the email creating wizard there is an option "Monitor open-rate from the email". By default it's turned on so you don't have to change anything. If you, for some reason, don't want to monitor open-rate uncheck the option. When SalesAutopilot sends an email, it replaces the mergetag with an invisible image. When the recipient opens the email the email client downloads this image and SalesAutopilot logs the parameters (opening time, which email was opened and which delivery schedule sent the email) of the subscriber's action.. It's important to understand that open-rate is note a 100% precise metric because to measure email openings it's required that email client is enabled to display images. Nowadays most of the email clients (Outlook, Thunderbird, Gmail, Yahoo stb.) don't display images by default. The recipient has to enable the display of images from the email. Generally it's possible to allow to display images from a given sender permanently. It's recommended to ask recipients to allow displaying images for the emails received from you. Because of these it's not possible to measure open-rate in case of plain-text emails. Another issue is when the email client has a preview function and it's turned on. The preview will download the email with the images without the recipient actually reading the email. So don't rely on open-rate as a precise metric because it's impossible to know the exact open-rate. Use it as a general guiding value. Email open-rate is percentage of the quotient of the number of sent emails and the number of measured opens. So if you sent 10 emails and the open rate is 20% it means that 2 emails were opened out of the 10. What is the general average (expected) open-rate? There is no such thing as general average open-rate. The rate depends on the time the email is sent, the engagement of subscribers and many other factors. There are experimental values by industries. We can say that 20-40% open-rate is average, above that is good, but don't expect more than 80% open-rate. As your list is growing, the open-rate is usually decreasing. Probably because smaller companies have more personal relationships with their subscribers. Companies who have an enthusiastic support group the open-rates are usually higher. For example churches, sport clubs and non-profit organizations. Content dedicated to a specific market niche usually has a higher open rate than those addressed to a wider audience. How can I improve open-rate? Test different subject lines. Instead of stereotypical subject lines try to write a subject line that connects to the theme of the email. Try to send your emails on different days of the week. Maybe your audience prefers to read at weekends, but it's also possible that they have time to read your emails on Wednesday mornings. Put the most important part of the content at the top. Many recipients are deciding to open and read the email based on the preview. Communicate regularly with your list. If you forget your subscribers probably they will forget you as well. On the other hand, don't flood them with huge amount of information. Test out the proper balance or ask your subscribers.